The more common dish at home was fish caldine served over a bed of steamed rice. The fish was usually pomfret, its mild and tender taste enhanced by the flavours of the spices. This avataar of Caldine is equally delicious as the original one. I hope you enjoy it as much as I do. 1. Heat the oil in a deep pan. Add cumin seeds and green chilli and let them splutter. 2. Add ginger and garlic pastes and saute for a minute. 3. Add the onion and tomato and saute till onion turns a light pink. 4. Add cauliflower florets and just enough water to cover the base of the pan. Add salt and turmeric powder. Cover the pan with a lid and let cook for about 8-10 minutes. 5. Once the water has evaporated and the cauliflower is almost cooked, add the coconut milk and simmer, uncovered, on a low flame for another 5-6 minutes. Serve hot with phulkas or steamed rice. 1. If you prefer to make this with fish, simply replace the cauliflower florets with fish or prawns in step 4 of the recipe. Adjust the cooking time depending on the fish being used. 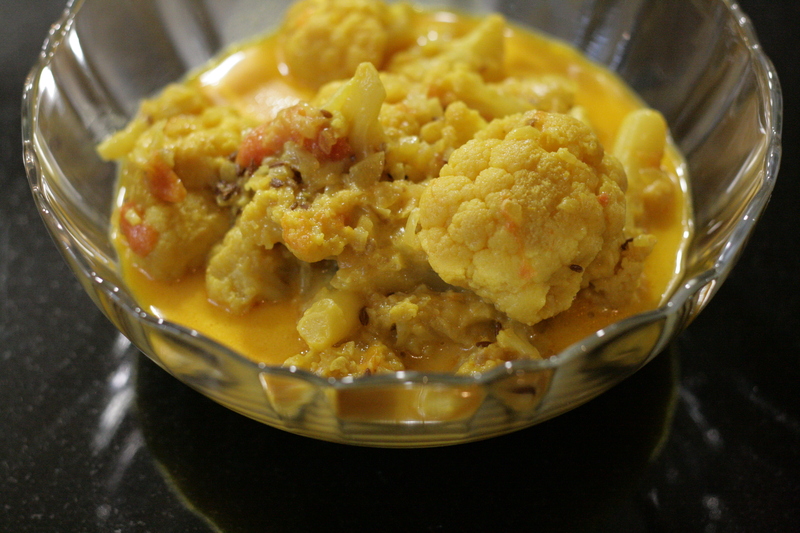 This entry was posted in A-Z Blogging Challenge 2015, Goan cuisine, Vegan and tagged #AtoZchallenge, Caldine, Cauliflower caldine, epicurious, Goan recipes, Mumsnet Blogging Network, vegan cauliflower curry. Bookmark the permalink. I think pomfret is the tastiest fish in the whole world. Cauliflower Caldine looks tasty. Thanks for this yummy looking recipe, must try. Not the biggest fan of cauliflower but this sounds like a great fish dish! I am going to try this with fish as me and hubby are both seafood lovers. Thanks for sharing! I’d love to know what you think when you’ve tried it. 🙂 Thanks! Man, That looks yum and I love cauliflower – it’s so versatile 😀 Dry, in gravy or in parathas..